Camden Boston, Rockland, Camden, Belfast, Bucksport, Bangor. Return voyages: Bangor, Winterport, Bucksport, Belfast, Camden, Rockland, Boston. Belfast Boston, Rockland, Camden, Belfast, Bucksport, Bangor. 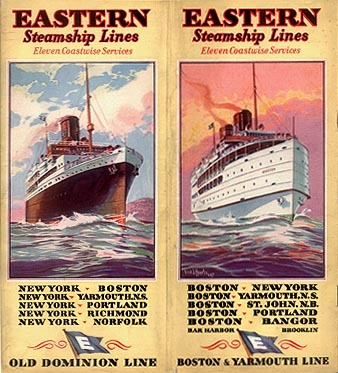 See the archives section for more brochures of Eastern Steamship Lines. 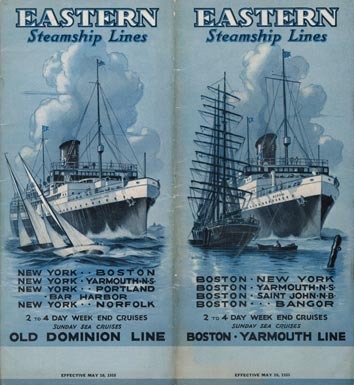 See also Old Dominion Line and Yarmouth Line. This page last updated April 20, 2014.